Online Applications will run for six weeks from 19th September- 31st October 2016. 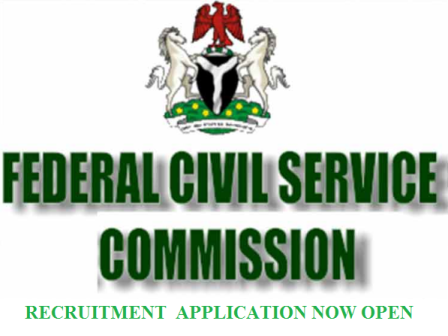 Federal Civil Service Commission Announces Vacancies in The Federal Civil Service. Interested Applicants can complete and submit Applications Online now. According to the statement signed by Hon. Chairman, Federal Civil Service Commission Mustaphu L. Sulaiman, the Federal Civil Service has called for applications into new positions in the service. Suitably qualified candidates with character and integrity, who are interested in making career in the Federal Civil Service Commission (FCSC), are invited to apply online on FCSC website (vacancy.fedcivilservice.gov.ng) for any of the posts indicated in each of the MDAs listed above. Completed Application Forms must be submitted where collected on or not later than six (6) Weeks from the date of this Publication (Advertisement). All Application Forms should be submitted in a sealed envelope clearly stating the Ministry, the post applied for. Apply now and also share this post to your friends and well wishes to apply too. Labels: Jobs in Africa, Jobs. Recruitments Jobs.